Here are 8 2019 wedding trends to pour over on Pinterest. Here are 8 whimsical wedding trends that will be everywhere in 2019. For more wedding planning content and real wedding inspiration, visit out Hitched Weddings hub page. Wedding trends, like in fashion, can be fickle. One minute, you’re planning a tres chic on-trend wedding and the next, Vogue reckons wedding trends like your sweet photo bomb wall are so done and mason jars are tacky. In 2018, we saw whimsical wedding trends like with fairy lights, chalkboard signage, blush pink tones and flowers hanging from the ceiling. It was lovely, truly. But as we say goodbye to another year (and rose gold everything), it’s time to start thinking about these 2019 wedding trends if you’re tying the knot next year. 1. Floral installations for centrepieces. According to the Pinterest 100: The top trends for 2019 report, searches for floral garlands draped over tables or line up together like a curtain or photo booth background are up by a whopping 1,154 per cent. This trend is inspired by modern Indian ceremonies like Priyanka Chopra and Nick Jonas’ recent wedding. Wedding Wire reports floral installations will come down from hanging from the ceiling and onto tables – sculptural floral installations on tables are the new centrepieces. Sunday wedding ceremonies and receptions as a part of a weekend-long celebration a la Karl Stefanovic and Jasmine Yarbrough’s Mexican wedding are becoming a thing, Wedding Wire reports. 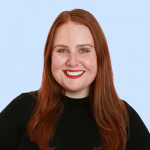 The Pinterest 100: The top trends for 2019 report also found searches for gold wedding dresses have increased by 1,552 per cent. This includes champagne gold and light gold dresses, dresses with gold detailing or foil, or all out gold, sparkly dresses. 4. Smoke bomb photo shoots. Pinterest searches for smoke bomb photography are up by 436 per cent. 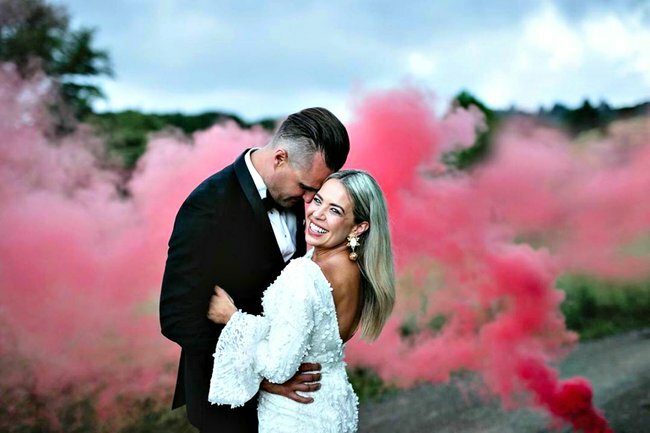 Smoke bombs of every colour add big drama to wedding and engagement photo shoots. Forget millennial pink. Prepare to see lots of lilac in 2019. From flowers and decor to bridesmaid dresses and even bridal hair (Pinterest searches for lilac hair have grown by 1,077 per cent), pale to vibrant shades of lilac will be everywhere. People are opting to dress up their backyards over hiring wedding venues, and it’s pretty cute. There’s lots to love about a backyard wedding. Budget-friendly and free from liquor licences, Pinterest searches on the topic are up by 441 per cent. Chalkboards are out, and neon signage is in. Aside from trending on Pinterest (searches up by 281 per cent), having your favourite quote, saying, or your names just looks really bloody cute. Say goodbye to rose gold. Wedding Wire predicts copper and rust are the next big colours for metallic weddings, overtaking brass, brushed metals and silver. Planning a wedding? We got you, get every helpful, hilarious episode of our wedding planning podcast Hitched in your ears below.